Felltop Cottage Self-cateringA newly refurbished property located in a quiet residential area a few minutes level walk to the town centre and amenities. The cottage provides spacious, well-equipped accommodation in an ideal location to explore the area. The cottage is owner maintained and has been decorated and furnished tastefully and thoughtfully to provide a property offering warm, clean, comfortable accommodation to a high standard. Centrally heated and double glazed throughout, the cottage comprises of a spacious bay fronted lounge with stone crafted fireplace and flame living fire. There is a separate dining room and kitchen on the ground floor and a large king size bedroom, twin room and family bathroom, with bath/shower on the first floor. Adjacent to the kitchen there is secure cycle storage and drying area for those muddy boots and wet clothes. Parking is on street in front of the property, it is free and unrestricted. Felltop Cottage is an ideal base with Derwentwater Lake shore and Borrowdale only 10 minutes walk away. A newly refurbished property located in a quiet residential area a few minutes level walk to the town centre and amenities. The cottage provides spacious, well-equipped accommodation in an ideal location to explore the area. Freeview TV, rear porch provides excellent bike and muddy boot storage, safe and secure. Paved outside area to the rear of the property. Children welcome from any age. Felltop Cottage offers weekly bookings starting on Saturday and short breaks of 3 days starting on any day in some seasons. One large king-size bedroom and 1 twin bedroom. All linen, heating and electricity included. Towels can be hired at an additional cost. Felltop offers weekly bookings starting on Saturday and short breaks of 3 days starting on any day in some seasons. Entering Keswick along Penrith Road turn left followed by immediateleft into Southey Street, just before pedestrian crossing. Cumbrian Cottages is on the ocrner. Helvellyn Street is third turning on left. Felltop Cottage is 50yds on left-hand side. Using Victoria Street bus stop, head towards pedestrain crossing and fololow directions as above. The cottage was well equipped and very clean. 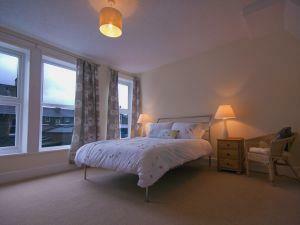 due to the location of the bedrooms and bathrooms the property is not suitable for wheelchair users.